Photograph © 2010 Stephanie Hough. Thanks to Cisco for the profile. I am very happy and privileged to presented among such an amazing group of creative people… including a few old comrades (Hey, Andrew, Josh, Ingrid, Mike!). After his return to Cork, Ireland in late 2013, Park has been sorely missed here in New York. Ah, makes me a little homesick for Brooklyn. Hope to be back one of these days! Big, heart-felt thanks to Kyoko and Josh for organizing the event. I’m touched, and could not have asked for a better send-off. Thanks to everyone who made music, and for creating that welcoming, friendly vibe. (And a particular pleasure to finally perform with Kyoko, Ken and Fay!) And thanks again to Scott Friedlander for the documentation. From that vocal/guitar chorus (Kyoko, Viv, Fay, Nick and I) to the jazz racket of Ken and I joined by Tom and Ingrid… my spirits have been lifted! I’m honored to have been part of a fantastic iteration of Gowanus Company (November 26), and feel enormously blessed to have been welcomed into such an incredible community. Big, heart-felt thanks to Kyoko and Josh for organizing the event. I’m touched, and could not have asked for a better send-off. Thanks to everyone who made music, and for creating that welcoming, friendly vibe. (And a particular pleasure to finally perform with Kyoko, Ken and Fay!) And thanks again to Scott Friedlander for the documentation. This Tuesday (November 26, 2013), at 7:00pm: My last gig in Brooklyn before the Big Move! Gowanus Company with Dan Blake (saxophone), Olie Brice (double bass), Viv Corringham (voice and electronics), Nick Didkovsky (guitar), Michael Evans (drums), Ken Filiano (double bass), Christopher Hoffman (’cello), Jason Kao Hwang (violin), Kyoko Kitamura (voice), Ingrid Laubrock (saxophone), Jeremiah Lockwood (voice and guitar), Russ Lossing (piano), Han-earl Park (guitar), Tom Rainey (drums), Josh Sinton (saxophone and clarinet), Fay Victor (voice) and others takes place at Douglass Street Music Collective (295 Douglass Street, Gowanus, Brooklyn, NY 11217) [map and directions…]. $10 suggested donation. Tuesday, November 26, 2013, at 7:00pm: Gowanus Company with Dan Blake (saxophone), Olie Brice (double bass), Viv Corringham (voice and electronics), Nick Didkovsky (guitar), Michael Evans (drums), Ken Filiano (double bass), Christopher Hoffman (’cello), Jason Kao Hwang (violin), Kyoko Kitamura (voice), Ingrid Laubrock (saxophone), Jeremiah Lockwood (voice and guitar), Russ Lossing (piano), Han-earl Park (guitar), Tom Rainey (drums), Josh Sinton (saxophone and clarinet), Fay Victor (voice) and others. Curated by Kyoko Kitamura, Josh Sinton and Han-earl Park, the event takes place at Douglass Street Music Collective (295 Douglass Street, Gowanus, Brooklyn, NY 11217) [map and directions…]. $10 suggested donation. My last gig in Brooklyn, New York, and, for me, it’s my leaving party. I’m honored to be part of this event instigated by Kyoko and Josh. Unfortunately the performance by Viv Corringham and Han-earl Park that was to take place on November 17, 2013 at Downtown Music Gallery, New York has been canceled. Sorry about that. I’m offering the video clips of the August 13 performances by Gerald Cleaver and Han-earl Park, and Viv Corringham and Andrea Parkins as a kind of consolation (the time Viv and I almost performed together). Next up: performance in Pittsburgh (November 7) as part of Crucible Sound, then back to Brooklyn (November 20) for a duo performance with Anna Webber. See the performance diary for up-to-date info. Han-earl Park, Catherine Sikora and Josh Sinton (Harvestworks, NYC, October 29, 2013). Photo © 2013 Emilio Vavarella. 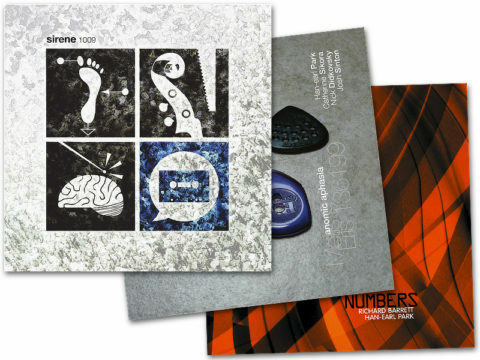 I am greatly indebted to Catherine Sikora and Josh Sinton for doing the heavy lifting, and turning my barebone sketches and speculations into music; for engageing intelligently, adventurously and imaginatively with the context at hand. These past months have been a learning experience for me as tactician, and I couldn’t have asked for better teachers. Thanks to Bruce and Manny at the World’s Best Record Store for hosting us, and for their unshakable advocacy of new music. Thanks to Carol Parkinson, Hans Tammen, Kevin Ramsay, Emilio Vavarella and everyone at Harvestworks for hosting our performance, their enthusiasm, and for their support. Thanks again to Kevin Reilly for his video documentation of the DMG performance [watch/listen…], and, as always, thanks to all who came to listen and witness the musicking—real-time and interactive. Next up: performance in Pittsburgh (November 7) as part of Crucible Sound, then back to New York (November 17) for a duo performance with Viv Corringham [canceled…] back to Brooklyn (November 20) for a duo performance with Anna Webber. See the performance diary for up-to-date info. New York, NY 10002 6:00pm Performance by Eris 136199 (Nick Didkovsky: guitar; Han-earl Park: guitar; and Catherine Sikora: saxophones). Also performing: Samm Bennett. Free admission. New York, NY 10012 7:00pm Performance of Metis 9 by Han-earl Park (guitar), Catherine Sikora (saxophones) and Josh Sinton (saxophone and clarinet). Pittsburgh, PA 15224 8:00pm (doors: 7:30pm) Performance by David Bernabo (guitar), Edgar Um Bucholtz (coronet, trash), J Wayne Clinton (synthesizer, homemade instruments), Han-earl Park (guitar) and Lenny Young (oboe) as part of Crucible Sound. 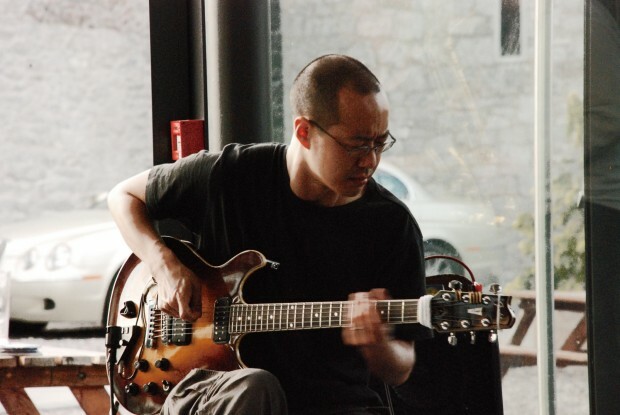 Brooklyn, NY 11215 8:30pm Performance by Anna Webber (saxophone) and Han-earl Park (guitar). Also performing: Joe Moffett (trumpet), Carlo Costa (drums) and Dan Peck (tuba). $10 suggested donation. Brooklyn, NY 7:00pm Soup and Sound House Concert with Jack Wright (saxophones) and Ben Wright (double bass) with Andrew Drury (percussion), Joe Moffett (trumpet), Dan Peck (tuba), Han-earl Park (guitar), Michael Evans (percussion) and others. Brooklyn, NY 11217 7:00pm Gowanus Company curated by Kyoko Kitamura, Josh Sinton and Han-earl Park. Performers: Dan Blake (saxophone), Olie Brice (double bass), Viv Corringham (voice and electronics), Nick Didkovsky (guitar), Michael Evans (drums), Ken Filiano (double bass), Christopher Hoffman (’cello), Jason Kao Hwang (violin), Kyoko Kitamura (voice), Ingrid Laubrock (saxophone), Jeremiah Lockwood (voice and guitar), Russ Lossing (piano), Han-earl Park (guitar), Tom Rainey (drums), Josh Sinton (saxophone and clarinet), Fay Victor (voice) and others. Recommended donation: $10. 2014– Europe I will be moving back to Europe at the start of 2014, and I am seeking performance opportunities for, in particular, my Europe-based projects including Numbers (with Richard Barrett), Mathilde 253 (with Charles Hayward and Ian Smith), and io 0.0.1 beta++ (with Bruce Coates and Franziska Schroeder). Interested promoters, venues and sponsors, please get in touch! 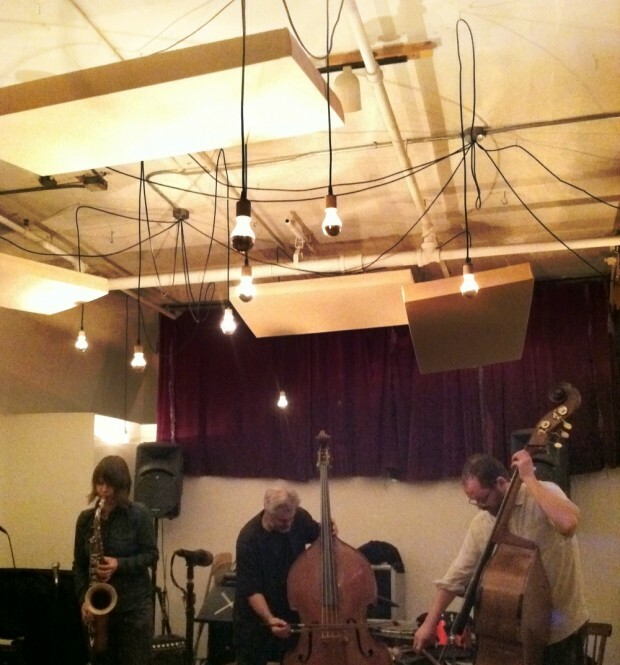 New York, NY 10009 10:00pm Performance by Evan Parker (saxophones) and Han-earl Park (guitar). Admission: $20 (students 13–19: $10; children <12: free). 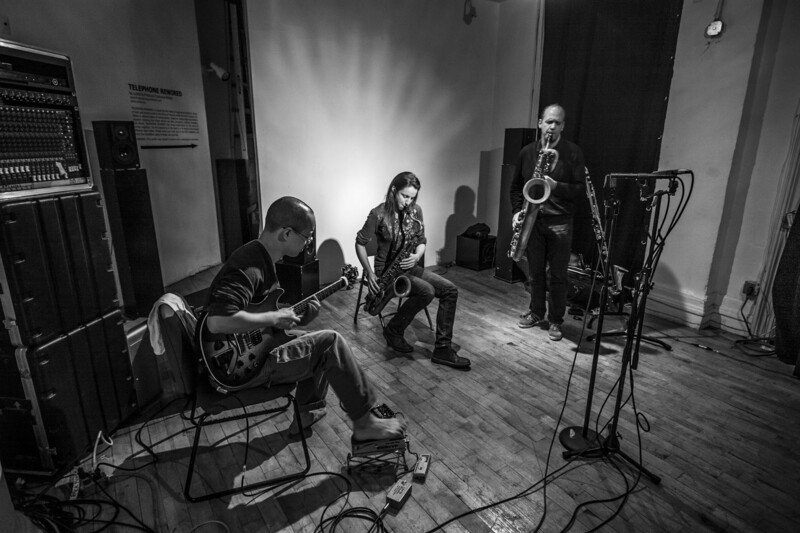 Brooklyn, NY 11217 8:00pm Performance of Metis 9 by Han-earl Park (guitar), Catherine Sikora (saxophones) and Josh Sinton (saxophone and clarinet). Also performing: Lisa Mezzacappa Trio (Chris Welcome: guitar and voice; Lisa Mezzacappa: double bass; and Mike Pride: drums). Recommended donation: $10. Brooklyn, NY 11221 9:00pm Performance by Han-earl Park (guitar) and Andrea Parkins (accordion and electronics). Also performing: Marc Edwards (drums) and Ernest Anderson III (guitar), and Tristan Shepherd (turntables) and Michael Foster (saxophone). Recommended donation: $8. 2013– North America Eris 136199 (Nick Didkovsky: guitar; Han-earl Park: guitar; and Catherine Sikora: saxophones) is seeking performance opportunities in North America, and, in 2014, elsewhere in the world. Like I said last time, necessity is the mother of invention. Two things sparked this second duo*3 event at DSMC: Gerald Cleaver was going to be available (been trying to corner him with a gig since January), and Viv Corringham had just moved to New York. I then asked Chris Pitsiokos if he’d like to contribute a set after Anna Webber had to drop out (as much as I enjoyed Chris and Philip White’s set, and I wouldn’t substitute it for anything else, would loved to have heard what Anna might have brought to the table—next time). And like the last duo*3 event, because of the performers, the results were unimaginably better than the minimal curatorial hand I played. So big, big thanks to all the performers at the August 13 event: to Chris and Philip White for their sense of play (and for consistently hitting the resonance frequency of the DSMC buzzer); to Viv and Andrea Parkins for a performance full of humor, and a kind of cargo-cult elegance; and to Gerald for his limitless imagination, for the 45 minute creative, musical and physical workout, and for making the set sound just that much better. And kudos again to Don Mount for the indefatigable work as video documentarist [watch/listen…]. Next up: performances coming up in September with Evan Parker as part of his residency at The Stone, and with Catherine Sikora and Josh Sinton playing Metis 9. See the performance diary for up-to-date info. Tomorrow (Tuesday, August 13, 2013), at 8:00pm (our set is c. 9:00pm): Gerald Cleaver (drums) and Han-earl Park (guitar) perform as part of an evening of duo improvisations. Also performing are Chris Pitsiokos (saxophone) and Philip White (electronics), and Viv Corringham (voice and electronics) and Andrea Parkins (accordion and electronics). 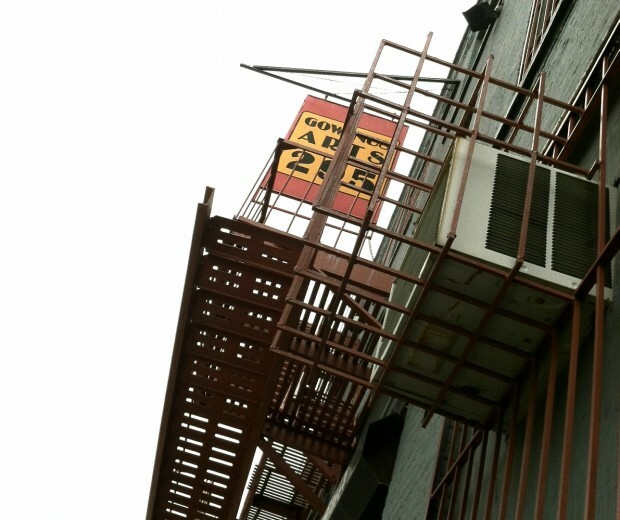 The event takes place at Douglass Street Music Collective (295 Douglass Street, Gowanus, Brooklyn, NY 11217) [map and directions…]. $10 suggested donation. I’m looking forward to, in particular, hearing Viv, who’s recently relocated to NYC, with Andrea, and of course playing with Gerald Cleaver for the first time. If you only come to… two of my gigs this year, make this one of them! Above video, with Ingrid Laubrock, from the previous duo event at DSMC. Videography by Don Mount.